Even before Hurricane Florence made landfall somewhere near the border of North and South Carolina, predicted damage from potentially catastrophic flooding from the storm was already being blamed on global warming. The theory is that tropical cyclones have slowed down in their speed by about 10 percent over the past 70 years due to a retreat of the jet stream farther north, depriving storms of steering currents and making them stall and keep raining in one location. This is what happened with Hurricane Harvey in Houston last year. But like most claims regarding global warming, the real effect is small, probably temporary, and most likely due to natural weather patterns. Any changes in hurricanes over 70 years, even if real, can easily be part of natural cycles — or incomplete data. Coastal lake sediments along the Gulf of Mexico shoreline from 1,000 to 2,000 years ago suggest more frequent and intense hurricanes than occur today. Why? No one knows. The Massachusetts Bay Colony in 1635 experienced a Category 3 or 4 storm, with up to a 20-foot storm surge. While such a storm does not happen in New England anymore, it happened again there in 1675, with elderly eyewitnesses comparing it to the 1635 storm. Until 2017, the United States went 11 years without a major hurricane strike — something that is statistically very improbable. Nine years into that 11-year hurricane drought, a NASA scientist computed it as a 1-in-177-year event. My point is that nature varies, and unusual things happen sometimes. Now it’s fashionable to blame stalling hurricanes on global warming. In the case of Florence, the jet stream is indeed pushed farther north. But examination of a weather map of the atmospheric flow at an altitude of 18,000 feet shows the jet stream is pushed farther south over western North America. This kind of natural variation in atmospheric flow is called weather, not climate change. It’s just a roll of the dice. Hurricane-steering currents are subject to whatever the weather happens to be when they arrive at the U.S. coast. But a major hurricane hits North Carolina on average once every 20 years or so. The last was Fran in 1996, which is 22 years ago. Coastal residents know they live under a yearly threat of hurricanes, and sometimes (though relatively rarely), one of those hurricanes will be very strong. Well, aren’t we being told these storms are getting stronger on average? The answer is no. The 30 most costly hurricanes in U.S. history (according to federal data from January) show no increase in intensity over time. The monetary cost of damages has increased dramatically in recent decades, but that is due to increasing population, wealth and the amount of vulnerable infrastructure. It’s not due to stronger storms. If humans have any influence on hurricanes at all, it probably won’t be evident for many decades to come. Natural variability is simply too large. This should not be surprising given that humanity’s greenhouse gas emissions have caused only a 1 percent change in the natural energy flows coursing through the climate system. Especially if it is government funded. Nailed it, by Professor Roy Spencer. Roy Warren Spencer (born December 20, 1955) is a meteorologist, a principal research scientist at the University of Alabama in Huntsville, and the U.S. Science Team leader for the Advanced Microwave Scanning Radiometer (AMSR-E) on NASA’s Aqua satellite. no slouch he – Wiki</a? Just for the hard of hearing over at septic science and the graun: this guy knows all about of what he speaks. AND AGAIN in echo; well said Roy! oh dear another link bracket error – in my haste, and profuse apologies. Try telling the BBC that it’s just weather and see how well that will go down. 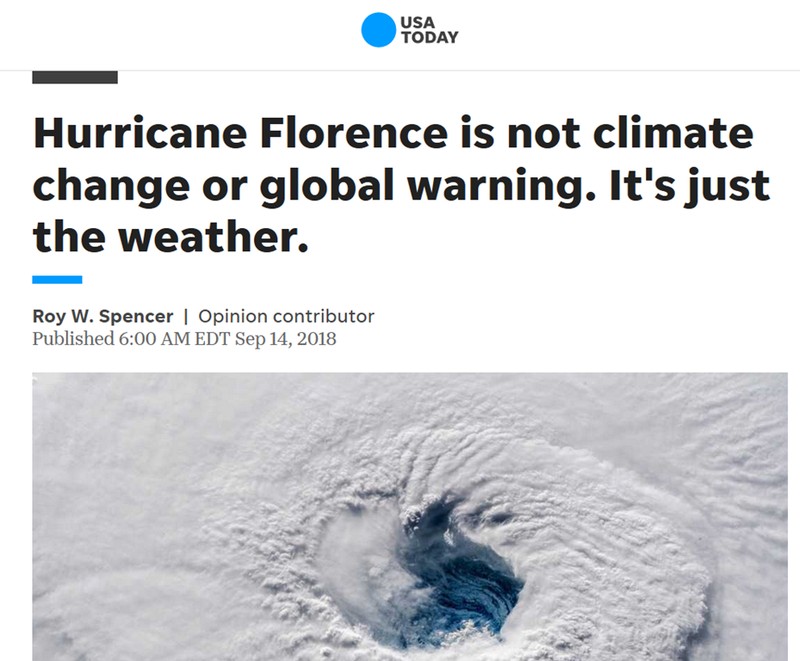 Neither is it global warming. The monetary cost of damages has increased dramatically in recent decades, but that is due to increasing population, wealth and the amount of vulnerable infrastructure. It’s not due to stronger storms. I would like to see CNN state the obvious, but that would require me to watch their lying propaganda masquerading as news—and I’m not about to do that. Any idea where the 1% change in climate energy flows caused by greenhouse gases comes from. This would be substantial given the small coriolis force that drives the world’s atmospheric-cyclones (Hadley cells etc). Any idea what he means by this statement and where it originates? I refer to a previous post when I mentioned that the ‘Carolinas’ had experienced 78 landfalling hurricanes since records were first kept in 1851. Is there anything out of the ordinary going on? No. Is Florence more extreme than anything that’s been experienced in recent recorded history? No. Is there a human fingerprint on recent Carolina hurricane activity? No. In which case, if you’re a climate alarmist, best you just move on. Nothing to see here! The only thing getting stronger is the brain-dead propaganda blaming man for natural forces, or for making them ‘worse’ – compared to what? Now it’s fashionable to blame stalling hurricanes on global warming. In the case of Florence, the jet stream is indeed pushed farther north. But examination of a weather map of the atmospheric flow at an altitude of 18,000 feet shows the jet stream is pushed farther south over western North America. Now climate change is making activists meteorologists unable to read weather charts. Meh…if they stall, they weaken. Blown away or washed away, that is the choice. When the next storm chooses to come through like an express train, that also will be global warming. I was curious about Hurricane Diana (1984) stalling off coast of North Carolina … so I created a 3-hourly satellite loop from available GOES-6 satellite imagery (GRIDSAT). Weather — water and temperature differences coupled to wind and atmospheric pressure variation. This one hurricane has taken several millions of tons of water as vapor from over the tropical Atlantic, naturally processed the energy contained in it while moving, and then dumped lots of the water on to the land. Millions of tons of atmospheric water on the move. I’m still very impressed by nature, and, IMO, this rather dwarfs what CO2 is hypothetically capable of doing. I wonder how much energy it takes to move all that water, to condense all that water vapor? How does that compare to the IPCC’s figures for energy from CO2 mediated global warming? The question of ‘energy’ came up a year ago. Cyclones are a fairly small contributor to the transfer of heat energy from the oceans to the atmosphere by evaporation and condensation. Everyday processes are much more significant. Out of the heat energy that is transferred by a cyclone only about 1/200 th. goes into moving air faster. As a ‘heat engine’ it is inefficient. This is a point that is generally misunderstood: for a cyclone concentrates a ‘curl’ that is already in the atmosphere – it does not cause it. My point is that millions of tons of water has been carried a thousand miles or more at 5 to 25 mph.